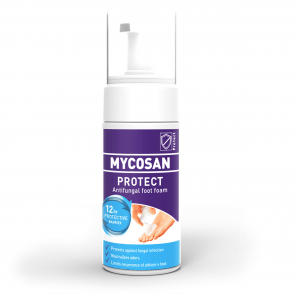 Mycosan Protect Anti-Fungal is a refreshing foot foam that protects the feet for 12 hours against athlete’s foot. It recovers the health of the skin of the foot and offers protections against a fungal infection by forming a protective film around the feet. The foam absorbs quickly, directly relieves from itching and burning feet due to moisture, stress or restrictive footwear. 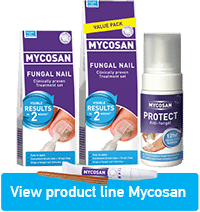 Mycosan Anti-Fungal Protection reduces the risk of re-infection. HOW DOES MYCOSAN PROTECT WORK? Clean your feet with a little or no soap and thoroughly dry them, also between the toes. For optimal protection, apply twice a day on dry feet and between the toes. After washing your feet re-apply. Against fungi and protect effectively against unpleasant odors.